Oh my gosh, these bangs are taking some getting used to, but I am in love with the change! This weekend, I went to Spoke and Weal! They just opened up their Chicago branch in the Lakeview neighborhood. Spoke and Weal is also located in NYC and LA. The staff was amazing, and I got a haircut by the talented Amanda Price. To start, I was served some warm herbal tea, and I was given a quick neck and shoulder massage. It was a great way to begin a haircut, and it definitely got me relaxed before getting my locks chopped off! After this, I was taken to the shampoo station where they used Aveda products on my hair. These products smelled great, and left my hair feeling silky smooth. Next, it was haircut time! Amanda did an awesome job walking me through how she was going to cut my hair. She started by taking a lot of the bulk off my thick hair, I can’t even describe the difference! My head feels so light, and it’s so easy to style my hair now. I got so excited with how the cut was going that I told Amanda to go the extra mile and do something fun with my bangs (which I haven’t cut in months). Amanda did just that! She gave me a fun, chic look right in time for NYFW! If you’re like me and trust very few people with your hair, I highly recommend the well trained and professional staff at Spoke and Weal. Check out some products, and my tour of the salon below! 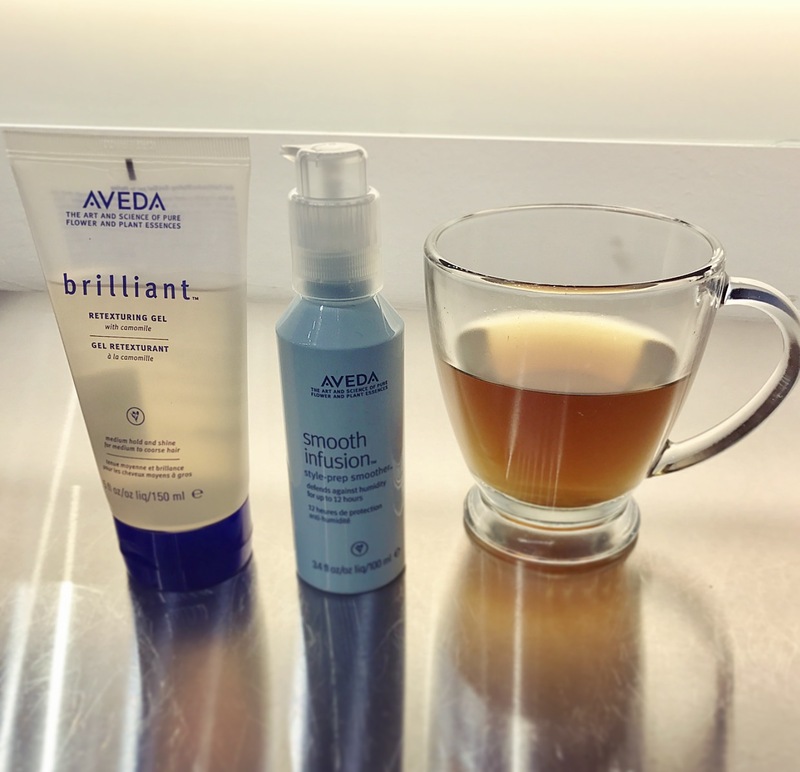 Aveda Brilliant Retexturing Gel -This product is what helped keep my hair stay flawless for more than 24 hours! Check out the salon above!